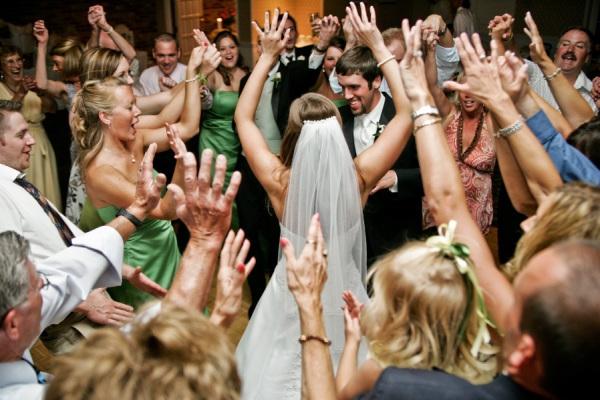 " Proudly providing entertainment in Central New York for over 20 years"
The Right Entertainer can transform any wedding day into an event your family and friends will still be talking about for years to come! Give Jones Tones a try! Jack Jones is the voice of " The Pride of the Orange "
Proud member New York State Disc Jockey Association. "We were thrilled to have Jack Jones from Jones Tones be the DJ at our wedding. The mix of music was exactly what we were looking for to keep the guests on the dance floor all night. He was extremely responsive and helpful in the months leading up to the event. I would absolutely recommend him!" "We were very happy with Jack Jones of Jones Tones DJs. Meeting before the wedding he was always friendly and professional. He was also very accommodating with mine and my husband's busy work schedule. He was more than a DJ but also helped us create and stay on schedule. He played all of the music from before the ceremony through the reception and it was all perfect. Great value for your money as well. Highly recommended!" "Jones Tones was professional and courteous. Our reception was quite a mixture of musical tastes/preferences and Jones Tones did a wonderful job blending everyone's musical choices :) I would highly recommend his DJ services to anyone looking for an affordable, professional and excellent DJ!" "Thank you very much for the wonderful DJ service that you provided to us on our wedding day. We hope you had a good time. We will definitely recommend you to anyone looking for DJ services. Thanks again!" "Thank you so much for the awesome evening of dance and fun. Our reception was everything we wanted it to be because of you. You did a great job. We had calls for days saying how great it was. You made everything run so smooth. We will recommend you to anyone with upcoming party plans." "We can't thank you enough for everything you did to help make our wedding one of the best days of our life. Your professionalism and the music that you played helped set the stage for an unforgettable night. We've received so many compliments on what a great time it was - it wouldn't have been the same without you as our DJ." "We cannot thank you enough for all you did to make our wedding reception a huge success. I could not have hoped for more from a DJ and Brian and I were thrilled with how you got and kept the party going until the very end." "We had such a great time and the dance floor was never empty. We received so many compliments, everyone had so much fun!" "Jones Tones threw an awesome party for our wedding. People are still talking about how much fun they had and that it was the best wedding they've been to. We had some guests up and dancing that we haven't seen dance in years! We hope that you had as much fun as we did!" "Our wedding day was so special we had nothing but compliments. We are appreciative that you were able to work with us since we had a slight delay. The uplighting was wonderful and we had a great time." "We recently had our wedding reception on July 13th at Justin's grill. We had a blast dancing up a storm with friends and family. Our dj was awesome and truly did such a wonderful job with making our day special. We cannot thank you enough and look forward to using again for another event." "I want to thank you for your amazing job you did at the wedding not only for the dj services but for the cocktail music as well. I didn't leave the floor all night, and I don't think many people did. Everything went so smoothly, you did an excellent job and I want to thank you!"